Make the Filling: Dice the onions and jalapenos, chop up the broccoli and mince the garlic. Brown the beef and remove from the pot. Cook the onions and jalapenos in the same pot until they start to brown. Toss in the garlic and spices and cook 1 minute. Add the tomatoes and scrape the bottom of the pot to get any of the browned goodness that is stuck. Return the beef to the pot and add the broccoli. Add about a cup and a half of water. Simmer this mixture until the liquid has slightly reduced and thickened; it should still have a decent wetness to it. While the filling is simmering away, mix the boiling water with the cornmeal and some salt and stir well. It will thicken after about 5 minutes. Add in the masa harina and the cold water and mix until you get a soft, almost peanut butter-like consistency. Spread your mixture into a deep roasting pan that has been buttered or greased. Add in a layer of cheese. Add in your taco mixture, making sure there is plenty of liquid. This liquid is needed to steam the tamale from the inside. Finally, add a last layer of cheese and cover with the remaining tamale dough. If it has thickened too much, add a little water to loosen it and make it spreadable. Top with more cheese and bake at 350°F for an hour. While the tamale is in the oven, make your salsa. Just chop up all the ingredients and finely mince the jalapeno and garlic. Mix it all together with some salt and you're done! Remove the tamale from the oven and let it sit for about 15 minutes before slicing into it. Serve with the salsa. Tamales are one of my favorite foods, but every time I think about making them, the task seems a bit too daunting and I give up before I even start. That’s because you have to wrap each tamale individually, and steam them for two hours! And before you even get started, you have to find the corn husks to wrap them in – which can be a pain. 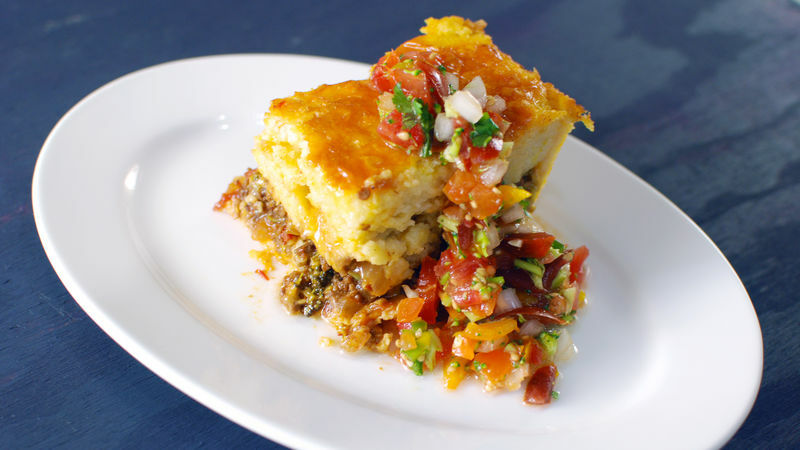 This Tamale Bake Casserole solves all those problems, and still leaves you with a delicious take on the classic Mexican dish. It hits all the right flavor notes, and is just what I want to eat this time of year. Step one is to make some flavorful taco filling. I added broccoli to mine on a whim, but feel free to add whatever veggie you like, or none at all! This tamale dough kinda looks like mashed potatoes! Fill up the casserole with a layer of dough and some cheese. Then more tamale on top. Yum! After an hour in the oven this thing is cheesy, bubbling, and very aromatic. Have tamales tonight with half the work! Dan Whalen says this dish was tamalways on his mind. He has been blogging for over four years at The Food In My Beard; check Dan's Tablespoon profile often to try his recipes with creative international spins!